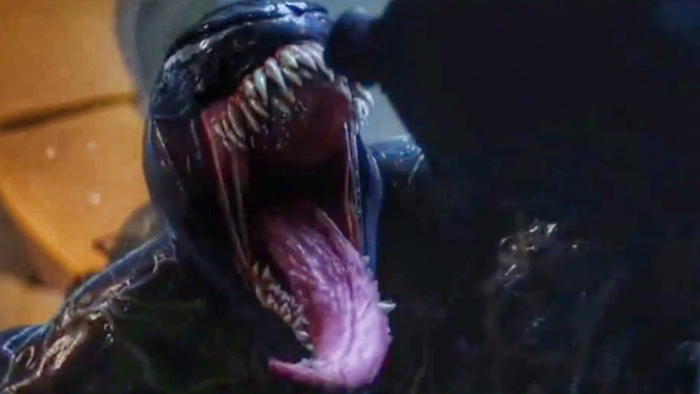 You are at:Home»Film»Action»Venom: Lacking Bite? Coming soon to a multiplex near you is Venom. An idealistic reporter, Eddie Brock, finds himself in contact with an alien symbiote that grants him super powers. But that definitely does not make Eddie a super-hero. It makes him something else. Something hungry. The film is directed by Ruben Fleischer (Zombieland) who knows a bit about the horror side of cinema. Useful knowledge for a Venom character that is steeped in horror elements from the comics. Venom may have started in The Amazing Spider-Man #252 back in 1984 but he spun off to become quite the bloody anti-hero on his own in later comics by Todd McFarlane and others. Venom was written by a team consisting Scott Rosenberg and Jeff Pinkner (Jumanji: Welcome to the Jungle), Kelly Marcel (Fifty Shades of Grey) and Will Beall (Aquaman). 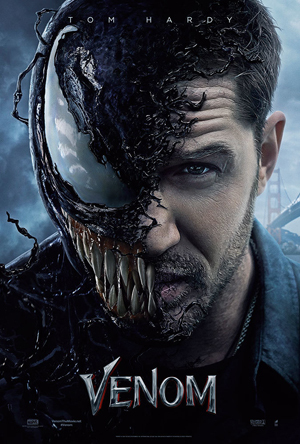 The cast is as follows: Tom Hardy – Eddie Brock / Venom, Michelle Williams – Anne Weying, Woody Harrelson – Cletus, Jenny Slate – Dora Skirth, Marcella Bragio – Neighbor, Riz Ahmed – Dr. Carlton Drake, Ron Cephas Jones – News Editor, Michelle Lee -Donna Diego, Reid Scott – Patrick Mulligan, Sope Aluko – Dr. Rosie Collins, Sam Medina – Parolee, Scott Haze – Roland Treece – Life Foundation Board Member. The film opens with a panoramic shot of the stars. Fitting. A reminder that Venom is not just a symbiote or parasite but is also very much an alien. Just a reminder here, this film is a first contact story just as much as it is a super hero film. More the former than the latter, really. Once we see the spaceship that is responsible for the arrival of Venom, and others of his ilk, to Earth we are introduced to his “travel agent.” That is, we are introduced to Dr. Drake, who is a billionaire along the lines of a pharma-evil Elon Musk type of character. He believes these alien symbiotes are the next step in pharmacology and more. 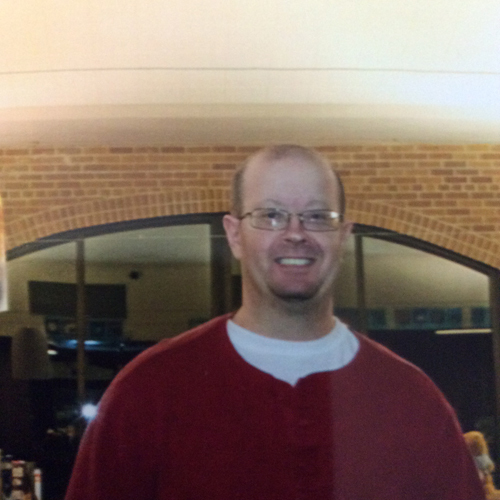 He has focused his Life Foundation on harvesting the samples at great cost in blood and treasure. Then cut to Eddie Brock and his fiancé Sarah. They seem an idyllic couple. She is a lawyer. He is a hard-charging investigative reporter. Think Geraldo without the mustache. Just some scruff. They both seem very much in love. Then Eddie makes a mistake. Things fall apart from there. Part of things falling apart leads Eddie into the path of Dr. Shirk, who works at the Life Foundation with Drake. She is having a crisis of conscience and wants Eddie to expose the Foundation for myriad heinous practices. He resists at first but then relents as he has no other real options at this point. Once Eddie and Dr. Shirk sneak into the Foundation labs, things go about like you would expect. Somehow Eddie gets infected. Then the fun begins. What follows is mix of super hero origin story and Dr. Jekyll and Mr. Hyde. Eddie discovers the enormous powers that Venom provides to him and has to deal with the cost of sharing his head-space, and his whole being, with an alien creature that mostly wants to eat. Meanwhile, Drake wants his symbiote back. He sends some goons to collect and the conflict between Eddie and Carleton escalates from there. By the end of the film, they get to resolve their issues with one another in tried and true super hero fashion – a spelling bee. No. A tussle. 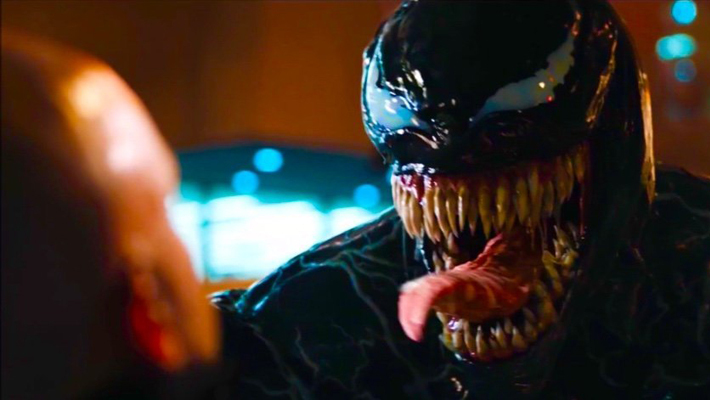 The film is really at its best when Eddie is trying to get a handle on his situation, and his sanity, in dealing with Venom. 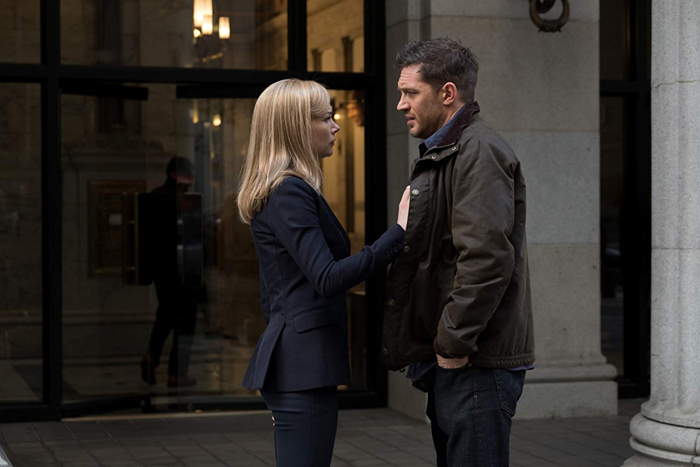 Only Eddie can hear him, so Tom Hardy has a great time acting like a distracted lunatic. There is some great humor there. Helps to balance the action pretty nicely. The sad reality is that the antagonist, Drake, is so unlikable and one dimensional that the film never has a chance to be more than a heightened cartoon. Poor writing indeed. The actor is charming and gloriously manipulative but there is no explanation for his drive or clarity to his madness. The other glaring issue is that the film clearly was shot as an R-rated movie by the director, Fleischer, and Sony over-ruled him and insisted on a PG-13 rated version hitting our theaters. Sony sees a Spider-Man sequel for Venom down the line when they should have focused on making a good first Venom movie that would even justify the possibility of there being a sequel at all. That first Venom movie should clearly have been R. The character screams for it. He chomps off HEADS! Must the R be spelled out when the character is best known for chomping heads off? Duh. No. Overall, the film was a disjointed but well-intentioned thrill ride. It did not deliver on its promise. But perhaps an R-rated cut on the DVD release will at least lift it up to satisfying B-movie status. Financial analyst by day. Film fan by night. I also work at being a Dad too. As time permits. Sometimes I write stuff too. Sadly, I am living in the wrong NFL city. Born in Philly. Live in MoTown. Nuff said. Book that changed my life was "The Hobbit". Proof that the multiverse is truly a worthwhile place resides in the joy and delight reflected in my child's eyes. Also, GoTG was pretty sweet as well. So there's that. Read the above article at your own risk. It is remotely possible we might disagree. Hopefully you are ok with that. I am.